Looking for pumpkin muffin recipes? This is the only one I use. It's easy and it's full of nutritious ingredients! It makes 12 regular sized muffins. These are most delicious when served warm. In the fall, when pumpkins are readily available, I like to buy several. I cook them, mash the flesh, and freeze it in small portions so I always have pumpkin on hand for use in pumpkin muffin recipes and other tasty treats. I've tried baking, boiling and steaming pumpkin, and I recommend steaming. There's no need to peel the pumpkin; just cut off the top, scoop out the seeds as though you were preparing to make a jack-o-lantern, scoop out the seeds and pulp, and cut the shell into chunks. Put them into a steamer basket and steam vigorously until very tender - about 30 to 45 minutes. Let them sit until cool enough to handle, and then peel off the skin and discard. Mash the cooked pumpkin and freeze it. Grease your muffin tins, or get out the paper muffin baking cups. In a large mixing bowl combine the flour, baking powder, baking soda, salt, cinnamon, nutmeg, ginger and raisins. Stir with a fork to mix well. Make a "well" in the center. In a small bowl, beat the egg until frothy. Add the oil, milk, honey and pumpkin. Stir well. Bake for about 20 minutes, or until a toothpick inserted into a muffin comes out clean. Substitute dried cranberries or other dried fruit for the raisins. I recommend using a spoon-shaped silicone spatula for mixing muffins. It works really well, both for combining the ingredients and for scraping the bowl. If I don't have toothpicks handy, I use a barbecue skewer or a piece of spaghetti to test the muffins. 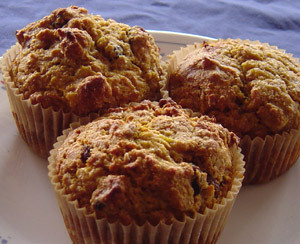 Return from pumpkin muffin recipes to easy baking recipes.